Back in January I attempted to a partial mash Berliner Weisse. I attempted a sour mash with only a couple pounds of grain left for two days in my oven set to warm (about 120 degrees). The grain was plenty stinky after those two days (like spoiled milk), so I knew I had some lacto-bacillus going on, but did I have enough? It turned out pretty decent, but I did cheat a bit and add some 88 percent lactic acid solution before bottling. I'm pretty happy with how the beer has turned out so far (it's certainly sour enough), so I decided to do what the Germans do and add some "Schuss" or raspberry syrup. I tried the beer with syrup (pictured) for the first time tonight and it really takes me back...not to Berlin though; but to a brewpub in Westmont, Illinois, called the Weinkeller. The place used to have three wheat beers on tap at all times; a hefe-weizen, a kristal (filtered) and a Berliner. I used to drink the Berliner both ways, with and without syrup. On at least one occasion I was made fun of for ordering this beer; the server told me that mostly girls order the beer with syrup because it was fruity. 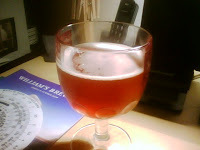 Well, I didn't care, I liked my Berliner and kept on drinking it. Sure I would order the other Weinkeller beers; the Aberdeen Amber (really an altbier), the Dublin (dry) Stout and their IPA were consumed fairly often. However, I have yet to visit another brewpub with a Berliner Weisse on tap, which is partly why I've taken matters in my own hands and attempted the style myself...and I am content. For years I've been a bitter brewer. I liked to make my beer bitter, but then I suppose I matured a bit and started to practice restraint with using hops (the bittering agent in beer) and started to craft beers that were still fairly bitter, but had more complex malt character and were also lower in alcohol. Somewhat ironically, the British call this type of ale "Bitter." I recently traveled to the Twin Cities in Minnesota. My expectation was that I would find, purchase and consume some tasty Surly beer. Surly is known for using a lot of hops in some of their beers, but also balancing them with the right amount and type of malts. I was successful in my search, finding three types of Surly at the Blue Max, a liquor store in Burnsville (a Twin Cities suburb) famous for its selection of 1,100 beers. I'll leave the details on the Blue Max for another post and instead get back the beer that I have in front of me. I'm back home and enjoying a pint (from the can) of Surly Bitter Brewer. This fantastic session beer pours a beautiful amber color with the perfect amount of carbonation, thus creating a white head of foam that drops to a nice firm collar of bubbles. Bitter Brewer is indeed very bitter, but that bitterness is tempered somewhat by the taste of highly kilned malts. A toasted character is present up front and the aroma is slightly toasty, too. The body is kept fairly light and the alcohol by volume is just four percent. This is one of the aspects of this beer that makes it great, you can drink a fair amount of it and not suffer from the more precarious aspects of alcohol consumption. Another aspect I like about Bitter Brewer is that it delivers a potent hop bitterness, yet the beer maintains it's drinkability. As you can probably tell, I really like this beer. Unfortunately, I cannot get this beer in cans in my neck of the woods (Chicago area), but it may be showing up in a few weeks at one of my local pubs and I will be very grateful.